Many of you are aware that the Rev. Ann Fontaine, formerly resident in the State of Wyoming, is under hospice care at her home in Cannon Beach, Oregon, where she and husband Jim had returned following Jim’s retirement from medicine in 2012. eSpirit felt that it would be appropriate to do a feature story on Ann given her long and legacy-laden history with the Diocese of Wyoming. The Diocese of Wyoming continues to hold Ann up in prayer during this very challenging time in her life. 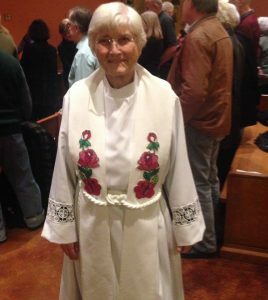 Ann is pictured wearing one of her favorite liturgical garments – a beaded stole made for her while serving as the interim priest for the Shoshone Mission in Fort Washakie. The congregation at the mission thought she needed a stole with the Shoshone Rose (their tribal symbol) on it. The bead work was done by church historian Audrey Ward. Ann recently gifted the stole to the Rev. Roxanne Friday, the first Eastern Shoshone female priest. Ann is praised by her friends in Wyoming for being a creative inventive, out of the box thinker. Outspoken and open about her thoughts, her feelings, and her tireless social justice focus, Ann is a person who never let unjust rules, leaders, or policies stand in her way. She is a fierce and loyal friend, an excellent leader, a mentor, a justice maker, a prophet and wise encourager. Ann was born November 22, 1941 in Portland, Oregon. She and her brothers were raised in Portland and spent many vacations and weekends visiting family on the Oregon coast, a place that captured her spiritual heart so much that she knew she would return and retire there some day. She and Jim were married in 1963 while Jim was still in medical school. He interned in Minneapolis and while driving through Wyoming, they stopped to visit Jim’s Uncle Fred. Jim fell in love with Wyoming on that trip. Upon completing his internship, Jim had to serve as a doctor for one of the uniformed services before he could start his residency. He joined the Public Health Service and requested a post in Wyoming. He was assigned to Fort Washakie on the Wind River Indian Reservation. Their daughter Kristin was born during that time. When Jim was ready to start his own medical practice, they decided to move to Lander, where they added two more children to the family and slowly began the process of becoming Wyomingites, and not newcomers anymore. Ann was very involved in Trinity Church and the Diocese of Wyoming during their 35 years of life in Lander. Prior to her ordinations, Ann served as Sunday School teacher, Sunday School Superintendent, Lay Reader, Lay Eucharistic Minister, Lay Preacher, Vestry Member, EfM Mentor and Mentor Trainer, Delegate to the Diocese of Wyoming Convention, Deputy to National General Convention from Wyoming from 1982 to 2012 (with a break while in seminary), and served on the National Executive Council. It is probably a vast understatement to say that Ann was “active” as a layperson from 1969 through her ordination as a deacon in 1995! But wait! There’s more! Many people in the Diocese of Wyoming were shaped theologically by Ann through her training mentorship of EfM (Education for Ministry). After moving to Wyoming, Ann reported being “at loose ends.” “I knew very few people and went from being very active in my local church to attending a church that was traditional and rather moribund at the time,” she said. She was recruited to attend an EfM mentoring program in Casper before she ever attended a single session of EfM coursework (a four-year program). EfM was a way for her to continue her studies without having to leave home. Ann literally saw EfM grow from an idea into a full education system with training, mentoring, and support systems. As Ann tells the story, “I went home a newly minted Mentor and tried to get six people together to start a group. I spent all summer trying to get six people to try this new thing. I’d get six and then two would have to drop out. It was very frustrating. Finally, I told God: “Okay God this is it, I need two more people, so if you want this to happen you need to send the people.” Suddenly, three more people signed up and I was off and running my first EFM group, while learning the material along with my group. Ann received her Master’s in Divinity in 1994 and was ordained as a Deacon in June 1995 and a Priest in January 1996 in Lander. Her Clinical Pastoral Education (CPE) training at the Veterans Nursing Home in Vancouver, Washington was very important to the development of her ordained ministry, giving her experience working with a specific community. It taught her listening skills and not to make the assumption that she was bring God to these people – God was already there. Her work as a priest was primarily as an interim and as a supply priest for congregations who were either in the search process for a new priest or who were in training to become a church with a local priest. Her longest posts were as interim for St. Thomas Episcopal Church in Dubois; for St James Episcopal Church in Riverton; as Associate Rector at St. John’s Episcopal Church in Jackson Hole; at Grace Episcopal Church in Astoria, Oregon and at St. Catherine’s of Alexandria Episcopal Church in Nehalem, Oregon. Ann worked as a priest from 1996 through her retirement in 2016. Ann reports that her world view for social justice and equality came from her hard-working parents, where all of the family, regardless of gender or age, were expected to help with chores. She was startled to discover that she and her husband had different ideas about “woman’s work around the house” after they were married. The 1970’s happened and the Church started to change. Women were able to serve as deputies to General Convention, and in 1974, 11 women were ordained into the priesthood. The ordination of women put women in positions to hear stories and respond to them in a new way. The 1979 Prayer Book allowed women to serve as ordained clergy. Ann remembers a couple leaving the church because they refused to take communion from a woman. In the late 1980’s and early 1990’s the church started finally to grapple with the issue of sexual abuse within the church. Ann feels that women clergy were key to the Episcopal Church’s response to reports of clergy sexual abuse. Many people worked very hard both publicly and privately to push for reforms and to identify changes the church could make to help protect children from future abuse, to limit the ability of abusers to get a foothold, and to create training and reporting resources to help vestry and other lay leaders set up systems that would help prevent situations that could lead to abuse in congregations. As a result of that work we have the “Safeguarding God’s Children” and “Safeguarding God’s People” trainings available nationwide and required for people in leadership roles regardless of whether they work directly with children or not. Let us indeed pray that she is “not quite done yet!” Thank you, Ann Fontaine, for your service to the Diocese of Wyoming and to the larger Episcopal Church.